DIE Martis, videlicet, 14 die Junii. Safety of Languard Fort to be considered. and for the Committee for raising Horse, to meet. Conference about informations from Lincolnshire and Leicestershire reported. Sir T. Dodington and Sir C. Berkley sent for. Message to the H. C. for a Conference about the Treaty with the Scots. with Letters from the King, to Two of the Committee for the Militia in London. and for Committees to meet with Merchants Strangers. Committee to meet with them. King's Letter to Sir Jo. Wollaston, to attend Him. Both to attend the Service of the Militia in London. Lenthall and Bruton in Error. Dutch Ambassador's Answer, about the Sale of the Crown Jewels, and buying up Arms, &c. in Holland. Letter to Mr. Pym, from the Committee at Lincoln. King's Letter to Mr. Booth of Killingholm, not to leave Lincolnshire. 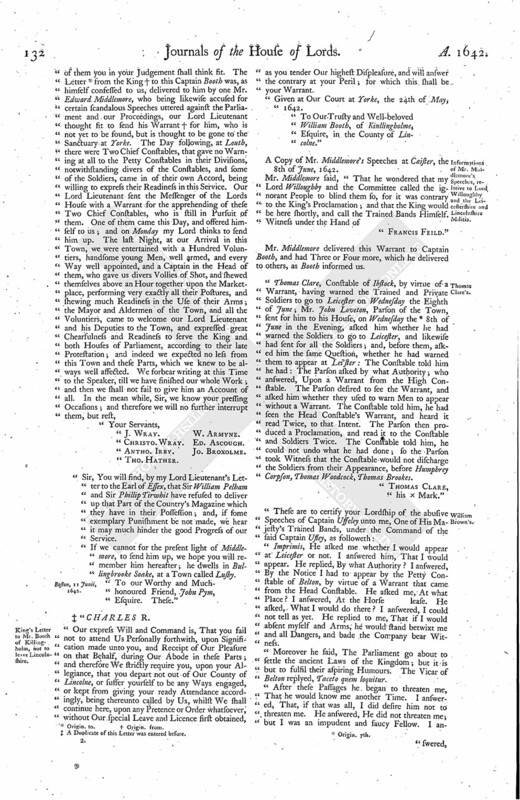 Informations of Mr. Middlemore's Speeches, relative to Lord Willoughby and the Leicestershire and Lincolnshire Militia. Delinquents sent for, for obstructing the Leicestershire Militia. Alexander Popham's Letter, about the Somersetshire Petition against the Proceedings of Parliament. Sir F. Dodington and Sir Charles Berkley to attend. 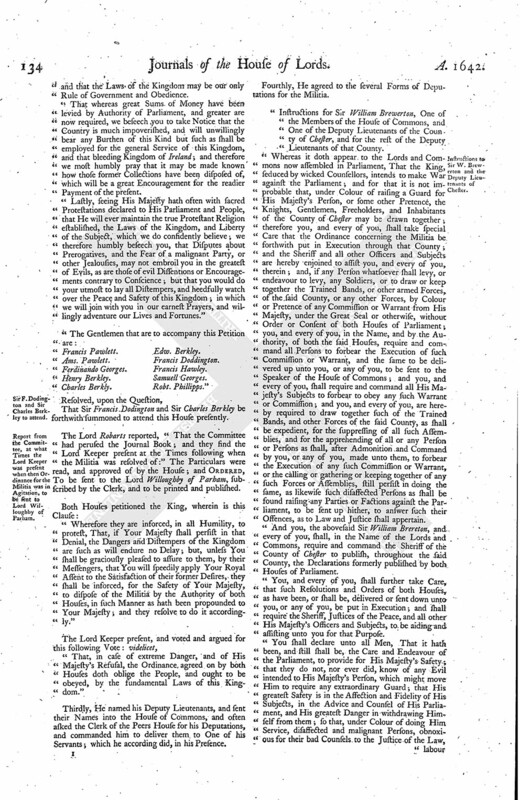 Report from the Committee, at what Times the Lord Keeper was present when then Ordinance for the Militia was in Agitation, to be sent to Lord Willoughby of Parham. Instructions to Sir W. Brewerton and the Deputy Lieutenants of Chester. The Lord North appointed to be Speaker this Day. It was moved, "To have a Conference with the House of Commons, about Langor Fort, which is of great Consequence to the Safety of this Kingdom; and, unless some speedy Course be taken, the Garrison will disband, for Want of Monies." 1. To desire a Conference, touching a Letter received from the Earl of Warwicke, concerning Langor Fort, in Essex. 2. To desire that the Committee of both Houses appointed to consider of raising of Horse, for the Safety of the Kingdom and the Parliament, may meet this Afternoon, at Three a Clock, in the Painted Chamber. "2. Next, was read a Warrant of the King's sent to Mr. Wm. Booth, of Killingholme. "A Copy of Mr. Middlemore's Speeches. "Next, an Account of the Execution of the Militia in Leycestershire. Six Hundreds were summoned, whereof Five appeared, and the other did not, being conceived there was some Tampering. "1. Tho. Clare's Certificate, Constable of Ibstocke. "3. Wm. Gilbert, of Whitwicke. "4. Robert Creswell, Constable of Raunston. "5. Jo. Milles, of Donnington. "7. Next, the Vote of the House of Commons was read. "8. After this, was read a Letter written to Sir Francis Popham, from Mr. Alexander Popham, concerning a Petition which is preparing in Som'settshire, against the Parliament. "9. Then a Copy of the said Petition was read. "10. That Sir Francis Dodington and Sir Charles Berkley be forthwith summoned to attend this House presently. "That the House of Commons desires their Lordships Concurrence in these Votes." Ordered, That the Persons mentioned by the House of Commons in these Votes shall be sent for, as they have desired. It was moved, "To have a Conference with the House of Commons, concerning the Result of the Scotts Treaty concerning Ireland, to acquaint them in what we do agree with them, and in what not." To desire a Conference, concerning the Treaty with the Scotts about Ireland. The Lord Newnham reported, "That he and the Lord Wharton have attended The States Ambassador, to acquaint him with the Informations received from Amsterdam, and the Particular of the Warlike Preparations and Monies at Amsterdam; and that the Jewels of the Crown were there to be pawned or sold. His Lordship said, He expressed to the Ambassador, that these Preparations were against the Peace and Quiet of this Kingdom, and might be a Prejudice to The State of Holland; therefore desired him, from the Parliament, to write to The State of Holland, that they might be stayed there, and not suffered to be transported into this Kingdom. The Ambassador seemed to be very ready herein, and desired a Particular of the Preparations, which his Lordship gave him; and he sent presently a Letter to The State, after the Post, which was gone; and this Morning he sent his Secretary, to let the Lords know, that the Post was overtaken, and the Letter delivered. "And concerning the Jewels of the Crown, he hath written, that the Subject might not meddle with them." That they have appointed their Committee to meet with the Committee of Lords this Afternoon, at the Time appointed; and concerning the other Part of the Conference, concerning Langor Fort, they will send an Answer, by Messengers of their own. 1. He presented to their Lordships Consideration Instructions to be given to Sir Wm. Brewerton, Baronet, and the rest of the Deputy Lieutenants in the County of Cheshire, for preserving the Peace of that County, and desire their Lordships Concurrence therein. 2. To present Two Letters sent from the King, to Two of the Committees for the Militia in the City of London (Agreed. Enter them. ); and desire their Lordships Concurrence in an Order made by the House of Commons concerning them. 3. To desire their Lordships would proceed against the Delinquents concerning the Petition of Kent. Ordered, Speedily to proceed against them. 4. To inform their Lordships, that the House of Commons have appointed a Committee, to meet with the Merchant Strangers this Afternoon, at MerchantTaylors Hall; and they desire their Lordships would please to appoint a Committee of this House to meet too. Are appointed to meet, with (fn. 1) the Committee of the House of Commons, with the Merchant Strangers, at Merchant-Taylors Hall, this Afternoon. Answer returned, as above Ordered. "It is Agreed, That what Towns shall be taken by the English in the Province of Ulster shall be kept by the English, and not delivered up to the Scotts." "Our Will and Command is, That, presently upon Receipt hereof, you repair hither (all Excuses set apart), and give your Personal Attendance upon Us, when We shall declare Our further Pleasure unto you. Hereof We command you not (fn. 2) to fail, as you tender Our Displeasure, and will answer the contrary at your Peril; for which this shall be your Warrant. "Given at Our Court at Yorke, the 6th Day of June, 1642. The like Letter was sent to Mr. Gibbs. "It is this Day Ordered, by the Lords and Commons in Parliament, That Sir John Wollaston, Knight, and Wm. Gibbs, Esquire, being employed by the Ordinance of both Houses in the Militia of London, be enjoined to stay here, and to attend that Service." The Counsel on both Sides (fn. 4) being called in, to argue the Errors between Sir John Lentball, Knight, and Brewerton, and the Counsel of Sir Wm. 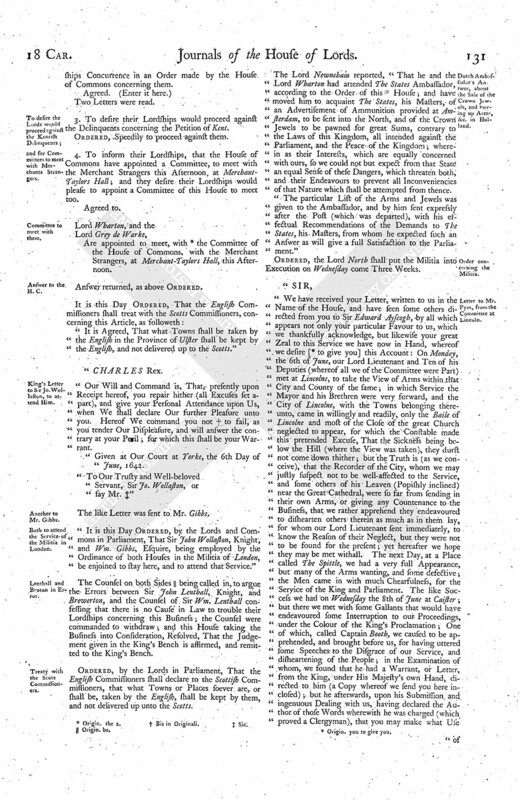 Lentball confessing that there is no Cause in Law to trouble their Lordships concerning this Business; the Counsel were commanded to withdraw; and this House taking the Business into Consideration, Resolved, That the Judgement given in the King's Bench is affirmed, and remitted to the King's Bench. Ordered, by the Lords in Parliament, That the English Commissioners shall declare to the Scottish Commissioners, that what Towns or Places soever are, or shall be, taken by the English, shall be kept by them, and not delivered up unto the Scotts. The Lord Newnebam reported, "That he and the Lord Wharton had attended The States Ambassador, according to the Order of this (fn. 5) House; and have moved him to acquaint The States, his Masters, of an Advertisement of Ammunition provided at Amsterdam, to be sent into the North, and of the Crown Jewels to be pawned for great Sums, contrary to the Laws of this Kingdom, all intended against the Parliament, and the Peace of the Kingdom; wherein as their Interests, which are equally concerned with ours, so we could not but expect from that State an equal Sense of these Dangers, which threaten both, and their Endeavours to prevent all Inconveniencies of that Nature which shall be attempted from thence. "The particular List of the Arms and Jewels was given to the Ambassador, and by him sent expressly after the Post (which was departed), with his effectual Recommendations of the Demands to The States, his Masters, from whom he expected such an Answer as will give a full Satisfaction to the Parliament." Ordered, the Lord North shall put the Militia into Execution on Wednesday come Three Weeks. "Sir, You will find, by my Lord Lieutenant's Letter to the Earl of Essex, that Sir William Pelham and Sir Phillip Tirwhit have refused to deliver up that Part of the Country's Magazine which they have in their Possession; and, if some exemplary Punishment be not made, we hear it may much hinder the good Progress of our Service. "If we cannot for the present light of Middlemore, to send him up, we hope you will remember him hereafter; he dwells in Bullingbrooke Soake, at a Town called Lusby. "To our Worthy and Muchhonoured Friend, John Pym, Esquire. These." "Our express Will and Command is, That you fail not to attend Us Personally forthwith, upon Signification made unto you, and Receipt of Our Pleasure on that Behalf, during Our Abode in these Parts; and therefore We strictly require you, upon your Allegiance, that you depart not out of Our County of Lincolne, or suffer yourself to be any Ways engaged, or kept from giving your ready Attendance accordingly, being thereunto called by Us, whilst We shall continue here, upon any Pretence or Order whatsoever, without Our special Leave and Licence first obtained, as you tender Our highest Displeasure, and will answer the contrary at your Peril; for which this shall be your Warrant. "Given at Our Court at Yorke, the 24th of May, 1642. "To Our Trusty and Well-beloved William Booth, of Kinllingholme, Esquire, in the County of Lincolne." A Copy of Mr. Middlemore's Speeches at Caister, the 8th of June, 1642. Mr. Middlemore delivered this Warrant to Captain Booth, and had Three or Four more, which he delivered to others, as Booth informed us. "Thomas Clare, Constable of Ibstock, by virtue of a Warrant, having warned the Trained and Private Soldiers to go to Leicester on Wednesday the Eighth of June; Mr. John Loveton, Parson of the Town, sent for him to his House, on Wednesday the (fn. 9) 8th of June in the Evening, asked him whether he had warned the Soldiers to go to Leicester, and likewise had sent for all the Soldiers; and, before them, asked him the same Question, whether he had warned them to appear at Lei'ster: The Constable told him he had: The Parson asked by what Authority; who answered, Upon a Warrant from the High Constable. The Parson desired to see the Warrant, and asked him whether they used to warn Men to appear without a Warrant. The Constable told him, he had seen the Head Constable's Warrant, and heard it read Twice, to that Intent. The Parson then produced a Proclamation, and read it to the Constable and Soldiers Twice. The Constable told him, he could not undo what he had done; so the Parson took Witness that the Constable would not discharge the Soldiers from their Appearance, before Humphrey Corpson, Thomas Woodcock, Thomas Brookes. "Thomas Clare, his x Mark." "Imprimis, He asked me whether I would appear at Leicester or not. I answered him, That I would appear. He replied, By what Authority? I answered, By the Notice I had to appear by the Petty Constable of Belton, by virtue of a Warrant that came from the Head Constable. He asked me, At what Place? I answered, At the Horse lease. He asked, What I would do there? I answered, I could not tell as yet. He replied to me, That if I would absent myself and Arms, he would stand betwixt me and all Dangers, and bade the Company bear Witness. "Moreover he said, The Parliament go about to settle the ancient Laws of the Kingdom; but it is but to fulfil their aspiring Humours. The Vicar of Belton replyed, Taceto quem loquitur. "After these Passages he began to threaten me, That he would know me another Time. I answered, That, if that was all, I did desire him not to threaten me. He answered, He did not threaten me; but I was an impudent and faucy Fellow. I an swered, If that were all he had to say to me, I bid him good Night. "Per me, William Browne, of Belton." William Gilbert, of Whitwick, in the County of Leicester, saith, "That George Moore, Constable of the said Town of Whitwicke, told him, (fn. 10) That Captain Wolsely came to the said Constable, on Monday the 6th of June, and told him, That he need not go to Leicester on Wednesday, for he would pawn his Land, Life, and Estate, to save him harmless. This, saith the Constable, Captain Wolseley told me, before John Bonnett. "The Mark of William M Gilbert." Robert Creswell, Constable of Rannston, saith, "That, having given Warning to the Trained and Private Men in the Town to come to Leicester, to shew their Arms, on Wednesday the 8th of June, before the Earl of Stanford, by virtue of a Warrant from the Head Constable; Captain Wolseley, on Monday Night, being the 6th of June, came to the said Constable's House, about Nine of the Clock; and he being in Bed, the Captain called to him at the Window, and asked whether he had given Warning to go in; who told him, he had the Day before. Then the Captain charged him that he should not call them to go in; saying, If he did, he would make him an Example to other Men: And the said Constable further saith, That, when he called upon the Soldiers to proceed to go in, Two of the Soldiers told him, that Captain Woleseley had charged them that they should not go in. John Mills, of Donington on the Heath, being the Trained Soldier, saith, "That, on Tuesday the 7th of June, Ancient Dudley called him unto him, and asked him whether he intended to go to Leicester the next Day. He told him, he did. Ancient Dudley asked him to what End he would go. Milles answered, To serve the King. Dudley told him, The King had not commanded him; and thereupon produced a Proclamation, which he desired one Edward Hall to read; and then wished him not to go to Leicester, for, if he did, he said, his Estate was lost, and his Life hazarded. This was spoken in the Presence of John Weston, Gentleman, Edward Hall; and Thomas Heicock. Henry Whitaker, Gentleman, Constable of Donnington on the Heath and Huckleslote, saith, "That, on Tuesday the 7th of June, Ensign Dudley came to him, and read Part of a printed Paper, and afterwards told him he would advise him not to go to Leicester of Wednesday (the Constable having a Trained Soldier by him), at his Peril. This was spoken and read in the Presence of Thomas Wight and John Goodman. That Captain Wolseley, Ensign Dudley, and John Loveton, Parson of Ibstocke, be forthwith sent for, as Delinquents, for the opposing and giving (fn. 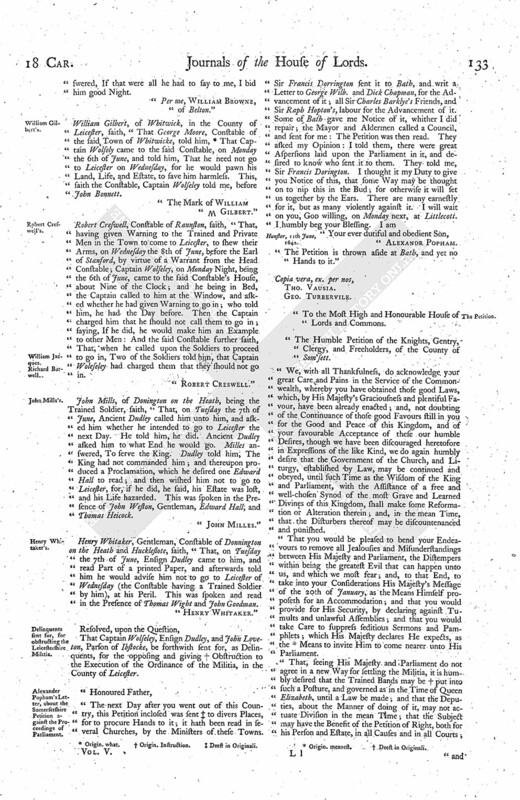 11) Obstruction to the Execution of the Ordinance of the Militia, in the County of Leicester. "The Petition is thrown aside at Bath, and yet no Hands to it." "To the Most High and Honourable House of Lords and Commons. "The Humble Petition of the Knights, Gentry, Clergy, and Freeholders, of the County of Som'sett. "We, with all Thankfulness, do acknowledge your great Care and Pains in the Service of the Commonwealth, whereby you have obtained those good Laws, which, by His Majesty's Graciousness and plentiful Favour, have been already enacted; and, not doubting of the Continuance of those good Favours still in you for the Good and Peace of this Kingdom, and of your favourable Acceptance of these our humble Desires, though we have been discouraged heretofore in Expressions of the like Kind, we do again humbly desire that the Government of the Church, and Liturgy, established by Law, may be continued and obeyed, until such Time as the Wisdom of the King and Parliament, with the Assistance of a free and well-chosen Synod of the most Grave and Learned Divines of this Kingdom, shall make some Reformation or Alteration therein; and, in the mean Time, that the Disturbers thereof may be discountenanced and punished. "That you would be pleased to bend your Endeavours to remove all Jealousies and Misunderstandings between His Majesty and Parliament, the Distempers within being the greatest Evil that can happen unto us, and which we most fear; and, to that End, to take into your Considerations His Majesty's Message of the 20th of January, as the Means Himself proposeth for an Accommodation; and that you would provide for His Security, by declaring against Tumults and unlawful Assemblies; and that you would take Care to suppress seditious Sermons and Pamphlets; which His Majesty declares He expects, as the (fn. 13) Means to invite Him to come nearer unto His Parliament. "That, seeing His Majesty and Parliament do not agree in a new Way for settling the Militia, it is humbly desired that the Trained Bands may be (fn. 14) put into such a Posture, and governed as in the Time of Queen Elizabeth, until a Law be made; and that the Deputies, about the Manner of doing of it, may not actuate Division in the mean Time; that the Subject may have the Benefit of the Petition of Right, both for his Person and Estate, in all Causes and in all Courts; and that the Laws of the Kingdom may be our only Rule of Government and Obedience. 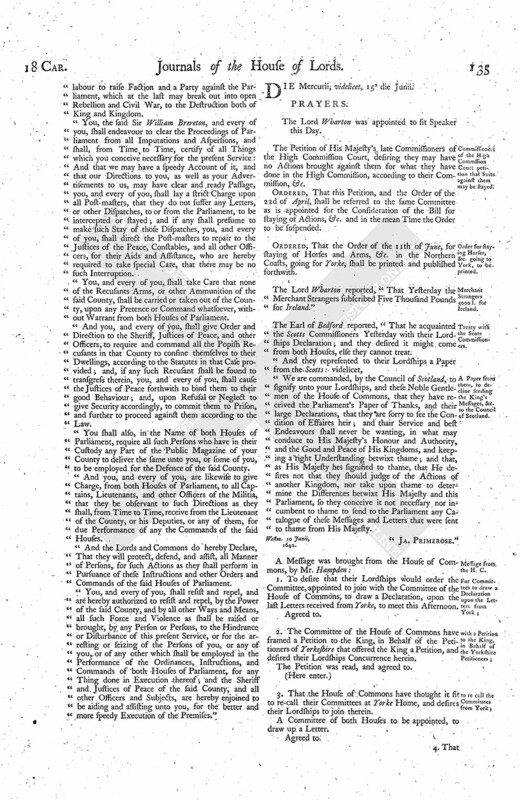 "That whereas great Sums of Money have been levied by Authority of Parliament, and greater are now required, we beseech you to take Notice that the Country is much impoverished, and will unwillingly bear any Burthen of this Kind but such as shall be employed for the general Service of this Kingdom, and that bleeding Kingdom of Ireland; and therefore we most humbly pray that it may be made known how those former Collections have been disposed of, which will be a great Encouragement for the readier Payment of the present. "Lastly, seeing His Majesty hath often with sacred Protestations declared to His Parliament and People, that He will ever maintain the true Protestant Religion established, the Laws of the Kingdom, and Liberty of the Subject, which we do considently believe; we therefore humbly beseech you, that Disputes about Prerogatives, and the Fear of a malignant Party, or other Jealousies, may not embroil you in the greatest of Evils, as are those of evil Dissentions or Encouragements contrary to Conscience; but that you would do your utmost to lay all Distempers, and heedfully watch over the Peace and Safety of this Kingdom; in which we will join with you in our earnest Prayers, and willingly adventure our Lives and Fortunes." That Sir Francis Dodington and Sir Charles Berkley be forthwith summoned to attend this House presently. 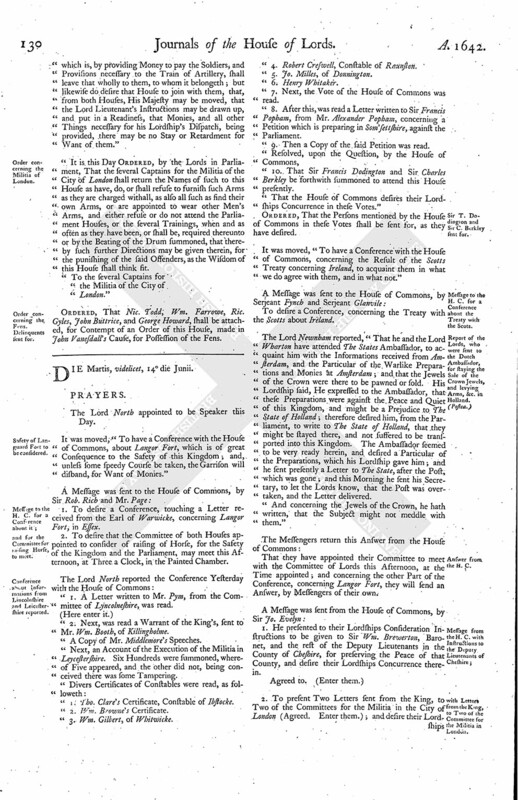 The Lord Robarts reported, "That the Committee had perused the Journal Book; and they find the Lord Keeper present at the Times following when the Militia was resolved of:" The Particulars were read, and approved of by the House; and Ordered, To be sent to the Lord Willoughby of Parham, subscribed by the Clerk, and to be printed and published. "Wherefore they are inforced, in all Humility, to protest, That, if Your Majesty shall persist in that Denial, the Dangers and Distempers of the Kingdom are such as will endure no Delay; but, unless You shall be graciously pleased to assure to them, by their Messengers, that You will speedily apply Your Royal Assent to the Satisfaction of their former Desires, they shall be inforced, for the Safety of Your Majesty, to dispose of the Militia by the Authority of both Houses, in such Manner as hath been propounded to Your Majesty; and they resolve to do it accordingly." "That, in case of extreme Danger, and of His Majesty's Refusal, the Ordinance agreed on by both Houses doth oblige the People, and ought to be obeyed, by the fundamental Laws of this Kingdom." Thirdly, He named his Deputy Lieutenants, and sent their Names into the House of Commons, and often asked the Clerk of the Peers House for his Deputations, and commanded him to deliver them to One of his Servants; which he according did, in his Presence. Fourthly, He agreed to the several Forms of Deputations for the Militia. "Instructions for Sir William Brewerton, One of the Members of the House of Commons, and One of the Deputy Lieutenants of the County of Chester, and for the rest of the Deputy Lieutenants of that County. "Whereas it doth appear to the Lords and Commons now assembled in Parliament, That the King, seduced by wicked Counsellors, intends to make War against the Parliament; and for that it is not improbable that, under Colour of raising a Guard for His Majesty's Person, or some other Pretence, the Knights, Gentlemen, Freeholders, and Inhabitants of the County of Chester may be drawn together; therefore you, and every of you, shall take special Care that the Ordinance concerning the Militia be forthwith put in Execution through that County; and the Sheriff and all other Officers and Subjects are hereby enjoined to assist you, and every of you, therein; and, if any Person whatsoever shall levy, or endeavour to levy, any Soldiers, or to draw or keep together the Trained Bands, or other armed Forces, of the said County, or any other Forces, by Colour or Pretence of any Commission or Warrant from His Majesty, under the Great Seal or otherwise, without Order or Consent of both Houses of Parliament; you, and every of you, in the Name, and by the Authority, of both the said Houses, require and command all Persons to forbear the Execution of such Commission or Warrant, and the same to be delivered up unto you, or any of you, to be sent to the Speaker of the House of Commons; and you, and every of you, shall require and command all His Majesty's Subjects to forbear to obey any such Warrant or Commission; and you, and every of you, are hereby required to draw together such of the Trained Bands, and other Forces of the said County, as shall be expedient, for the suppressing of all such Assemblies, and for the apprehending of all or any Person or Persons as shall, after Admonition and Command by you, or any of you, made unto them, to forbear the Execution of any such Commission or Warrant, or the calling or gathering or keeping together of any such Forces or Assemblies, still persist in doing the same, as likewise such disaffected Persons as shall be found raising any Parties or Factions against the Parliament, to be sent up hither, to answer such their Offences, as to Law and Justice shall appertain. "And you, the abovesaid Sir William Brereton, and every of you, shall, in the Name of the Lords and Commons, require and command the Sheriff of the County of Chester to publish, throughout the said County, the Declarations formerly published by both Houses of Parliament. "You, and every of you, shall further take Care, that such Resolutions and Orders of both Houses, as have been, or shall be, delivered or sent down unto you, or any of you, be put in Execution; and shall require the Sheriff, Justices of the Peace, and all other His Majesty's Officers and Subjects, to be aiding and assisting unto you for that Purpose. "You shall declare unto all Men, That it hath been, and still shall be, the Care and Endeavour of the Parliament, to provide for His Majesty's Safety; that they do not, nor ever did, know of any Evil intended to His Majesty's Person, which might move Him to require any extraordinary Guard; that His greatest Safety is in the Affection and Fidelity of His Subjects, in the Advice and Counsel of His Parliament, and His greatest Danger in withdrawing Himself from them; so that, under Colour of doing Him Service, disaffected and malignant Persons, obnoxious for their bad Counsels to the Justice of the Law, labour to raise Faction and a Party against the Parliament, which at the last may break out into open Rebellion and Civil War, to the Destruction both of King and Kingdom. "You, the said Sir William Brereton, and every of you, shall endeavour to clear the Proceedings of Parliament from all Imputations and Aspersions, and shall, from Time to Time, certify of all Things which you conceive necessary for the present Service: And that we may have a speedy Account of it, and that our Directions to you, as well as your Advertisements to us, may have clear and ready Passage, you, and every of you, shall lay a strict Charge upon all Post-masters, that they do not suffer any Letters, or other Dispatches, to or from the Parliament, to be intercepted or stayed; and if any shall presume to make such Stay of those Dispatches, you, and every of you, shall direct the Post-masters to repair to the Justices of the Peace, Constables, and all other Officers, for their Aids and Assistance, who are hereby required to take special Care, that there may be no such Interruption. "You, and every of you, shall take Care that none of the Recusants Arms, or other Ammunition of the said County, shall be carried or taken out of the County, upon any Pretence or Command whatsoever, without Warrant from both Houses of Parliament. "And you, and every of you, shall give Order and Direction to the Sheriff, Justices of Peace, and other Officers, to require and command all the Popish Recusants in that County to confine themselves to their Dwellings, according to the Statutes in that Case provided; and, if any such Recusant shall be found to transgress therein, you, and every of you, shall cause the Justices of Peace forthwith to bind them to their good Behaviour; and, upon Refusal or Neglect to give Security accordingly, to commit them to Prison, and further to proceed against them according to the Law. "You shall also, in the Name of both Houses of Parliament, require all such Persons who have in their Custody any Part of the Public Magazine of your County to deliver the same unto you, or some of you, to be employed for the Defence of the said County. "And you, and every of you, are likewise to give Charge, from both Houses of Parliament, to all Captains, Lieutenants, and other Officers of the Militia, that they be observant to such Directions as they shall, from Time to Time, receive from the Lieutenant of the County, or his Deputies, or any of them, for due Performance of any the Commands of the said Houses. "And the Lords and Commons do hereby Declare, That they will protect, desend, and assist, all Manner of Persons, for such Actions as they shall perform in Pursuance of these Instructions and other Orders and Commands of the said Houses of Parliament. "You, and every of you, shall resist and repel, and are hereby authorized to resist and repel, by the Power of the said County, and by all other Ways and Means, all such Force and Violence as shall be raised or brought, by any Person or Persons, to the Hindrance or Disturbance of this present Service, or for the arresting or seizing of the Persons of you, or any of you, or of any other which shall be employed in the Performance of the Ordinances, Instructions, and Commands of both Houses of Parliament, for any Thing done in Execution thereof; and the Sheriff and Justices of Peace of the said County, and all other Officers and Subjects, are hereby enjoined to be aiding and assisting unto you, for the better and more speedy Execution of the Premises." 5. Origin. you to give you. 8. A Duplicate of this Letter was entered before.